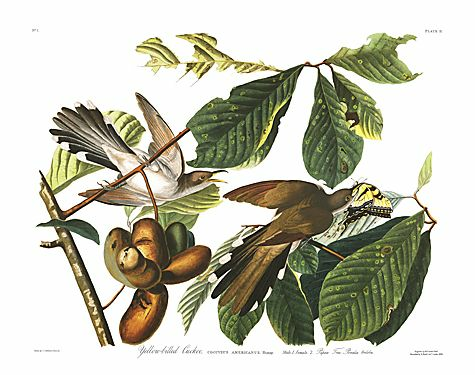 John James Audubon Limited Centennial Edition Giclee on Paper:"Yellow-billed Cuckoo"
Paper Size: 28" x 39"
Image Size: 19" x 25"
Edition: The "Audubon Centennial Edition" is published in association with the National Audubon Society, with each plate image bearing their stately embossed logo. Subscribers to the "Audubon Centennial Edition" can be assured a realistic collectible prominence and definitive quality of art. The "Audubon Centennial Edition" is strictly limited to only 200 hundred of each plate image worldwide. About the Art: The "Audubon Centennial Edition" of John James Audubon's "The Birds of America," double elephant folio is created in tribute to the 100-year anniversary of the National Audubon Society. John James Audubon's ambition and career has been hailed genius and is exemplified in his artistic creativity and historical accomplishments in capturing the reality of our nation's wildlife in the early 19th century. The significance of his life's accomplishments has given us one of our most revered national heirlooms. The "Audubon Centennial Edition" achieves this importance as a new generation of a genuine art connoisseur's treasure. The "Audubon Centennial Edition" is only the third comprehensive collection produced in 180 years since Audubon himself created the original, "Birds of America." Of notable significance is that the "Audubon Centennial Edition" is the first edition to meticulously restore the detail and brilliance of these plate images as when they were first revealed to art patrons in 1827. The "Audubon Centennial Edition" is created with extraordinary attention to every vital characteristic of each original masterpiece including coloration, image and paper size. In preparing the Havell engravings each was captured as a first generation plate image using a custom digital camera generating a 320-mega-pixel file. Then they underwent an exceedingly sophisticated rejuvenation process, rendering the finished Giclée plate image. The new edition is entirely conceived with archival processes and materials to meet the most stringent requirements and carries a lifetime guarantee. This is a formidable quality to be valued, affording not only years of viewing enjoyment, but prospective appreciation. The "Audubon Centennial Edition" like the original, "The Birds of America," double elephant folio comprises all 435 plate images painted by Audubon and printed by R. Havell & Son, in London, England. The 435 plate images depict 1,065 birds and each rendering of each species is life-size, an extraordinary reality. Of the 435 plate images there are three distinctive plate sizes referred to as a full plate, a half plate and a quarter plate. Each plate size in the folio numbers 87 full plates, 87 half plates, and 261 quarter plates respectively. Each plate image bears a plate number in the upper right hand corner. The plate numbers in the "Audubon Centennial Edition" correspond to the numbering in the "The Birds of America." It is our practice to interchange the word plate image for plate; consequently you can reference our plate image number in any collector's guide, or authoritative chronicle and identify the same image as in "The Birds of America." All plate images produced for the "Audubon Centennial Edition" are from "The Birds of America" double elephant folio collection at the John James Audubon Center, Mill Grove Museum, in Audubon, Pennsylvania. Subscribers will receive with each plate image, a Certificate of Authenticity, a John James Audubon Biography, a copy of the original "Ornithological Biography" of the particular bird species as written by John James Audubon, and a guide on "Caring for Your Fine Art." In addition, the limited edition images will be cosseted in an archival sleeve. The "Audubon Centennial Edition" is an extraordinary accomplishment in today's art world that is destined to become a renowned and significantly respected masterpiece for future generations.